Not much to report today. It snowed last night for all of 30 minutes, then rained for a long time, so today, all the streets were thick sheets of ice. The main road where we live is a highway, and it was shut down. Just all around not good! The good news is, I got a lot of work done today. I am putting together a proposal for a culture course to teach in the second half of the semester, since one of my grammar classes was canceled last minute due to low enrollment. A book I had ordered came in the mail, and I sent off the first drafts of my syllabus and course description. It doesn't sound like much, but it was a lot of work, and there's going to be much more once the course gets approved. Right now, I make lesson plans and teach based on the material the entire French faculty has created. Now, I am starting from scratch, coming up with things on my own, choosing my own books and making my own homework and exams. It's a lot like what I did in California, to be honest, except an advanced course and not basic grammar. A lot of work, but I could not be happier. The nerd in me is insanely excited and thrilled about this opportunity. The better news is, I put on my coat and shoes and braved the elements to walk over to the fitness center today for Week 1, Day 2 of Couch to 5K. The first week is all the same: walk 5 minutes, then alternate 60 seconds of running and 90 seconds of walking for 20 minutes, then a 5 minute cool down walk. 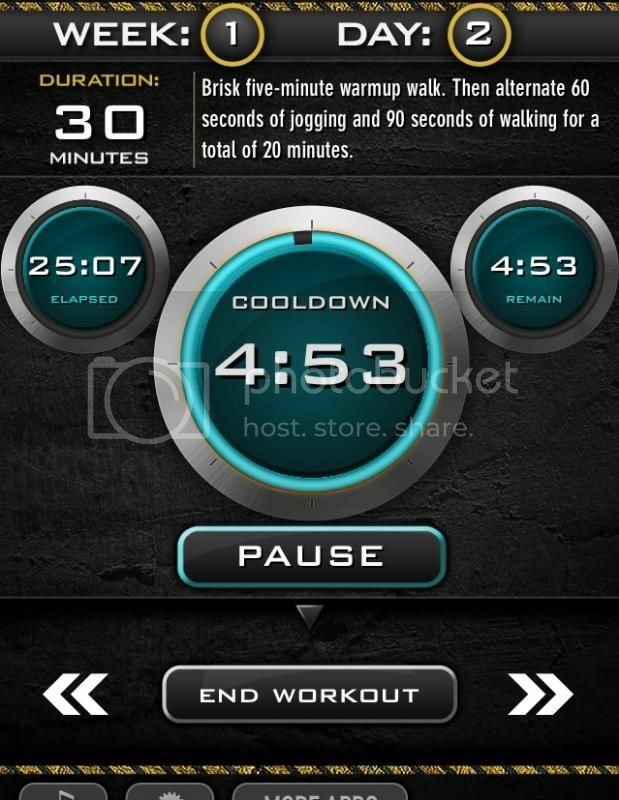 To keep track of the time, I got a C25K app. It was just called "C25K," and it has timers that go off when you need to switch from running to walking and vice versa. They're also all different colors, so you can visually check, in case you can't hear it. The treadmills in the fitness center have a great setting that lets you push a number and it automatically goes to that speed, so you can manually program your own interval workouts if you want. I walked at 3 mph (20:00/mile) and ran at 5 mph (12:00 mph). It's slower than my best, but faster than the first time I started running. I know eventually, I'll be back to sub-30 5Ks. Just need to keep running. While I ran today, I had very vivid flashbacks of running races. The feeling of giving it everything and how good it feels to cross a finish line. I don't know when I will race again, but I think the fire is starting to come back, and stronger than before. Between the work and the run, I kept myself busy today, and successfully avoided the kitchen cabinets. Breakfast was egg muffins with ground beef, mushrooms, and kalamata olives. Lunch was pulled pork with pineapple and the leftover broccoli slaw from the other night. Dinner was chicken fajitas with apple slices. I struggle with drinking enough water when I am home - at work, I have a fountain right by my office, and am always looking for excuses to get up from my desk. Thinking about setting a "hydration nudge" timer on my phone for weekends and days off, to remind myself. Some folks were asking about the pulled pork recipe - it was really simple, I just put a pork shoulder into the crockpot and dusted it with ground ginger, then drained two cans of pineapple (make sure it is packed in juice and not syrup!) and added those to the pot. I cooked it for 8 or 10 hours on low (I did it overnight) because it was a pretty big shoulder. Tomorrow is the last container of it, which means I got 9 lunches out of a $12 piece of meat. I will definitely make that again sometime, once the pork goes on sale again - when I got it, it was something like 50 cents off per pound, which makes a big difference in the grocery bill! Have you thought about signing up for a 5K to give yourself something to work towards? I always found it easier to run/workout when I working towards something. Nice job on the working out and keeping away from the snacks. And good luck with your class planning! That's the exact same app I have. I love it! P.S. You're doing GREAT! And I'm so glad you purchased a new pair of shoes. Repeat this phrase to yourself: I DESERVE IT! I enjoy reading your story so much and am so proud of you! TFS!